Dogs are highly intelligent creatures. They like to use their mind just as we do. They also can become bored and despondent if they don’t get the chance to use their mental ability regularly. This applies to all breeds of dog. However, dogs that have strong working breed heritage may become more frustrated than less active dogs. It’s very important that, as responsible dog owners, we tend to every need of our pups. This will help to ensure their health and well-being and also make our lives easier. A dog with a well-exercised body and mind will settle easily when you need and want him to. Working together with your dog will also help build on the relationship between you. It will teach your dog control and strengthen your bond, which will lead to easier training sessions in the future. If you train your dog with easy tricks and games, you can keep him active and mentally stimulated. There are many games you can play with your dog to get him to use his mind. A dog that likes to use his nose and is constantly sniffing around and interested in scents will appreciate search games. This type of game can be played outdoors or in the house and garden and with either a toy or treats depending on your dog’s preference. Let’s go over the stages of teaching your dog to search for something. Firstly decide on your dog’s reward. Save it for this particular game. It can be treats or a favorite toy. Only produce the reward when you do search play and put it away at the end. Initially find an area where you are unlikely to be disturbed. A maximum of five meters squared approximately will be enough at this early stage. This will help you and your dog to concentrate on the task at hand. Show your dog the reward and either get someone to hold him (or tie him up if safe to do so) whilst you take the desired reward away and pretend to hide it in four or five different places. Touch the areas you stop at to create a scent. Hide the reward in one of the places but make sure your dog does not see. Then return to the dog. Show him your empty hands and release him to find his prize. It’s good to create a key word or phrase at this point. Just something simple like “find it” will do. This command should be used from this point every time the dog is searching. He will sniff around whilst searching for the reward and should find it quickly. Once it is found call him back to you and either play with the toy or give him a treat and lots of praise. Vary the search areas to mix it up and keep it challenging for your pup. It is possible to do this inside the house using shelves and cushions to hide his prize. Or you can take the game outside and use gardens and outdoor furniture as hiding places. When your dog is finding his prize quickly every time you can progress the game by taking away the visual stimulation. Place the dog just out of site of the search area and get him to stay. Go into the search area and create a bit of a disturbance. Hide the reward within the area of search. Return to the dog to show your empty hands. If you do this well the dog should, when released, run straight into the area and search until he finds it. The areas that you can use this in are endless. You can shut him in the house and hide his prize in the garden. Hide a reward in a room then send him in. Put the reward in a bush at the park and eventually make the search a really long one. You can then do what is called proofing. This is honing his searching skill. Make the games longer. Put the reward in more complicated places. This will encourage your dog to think and work hard on each search. It’s important that you work through the stages of training at your dog’s learning pace. Watch out for signals that your dog may be losing confidence. He may show displacement behaviors such as stopping and scratching himself or constantly looking at the ground around him. If this happens it will be because your dog is confused or uncertain so there is no point going on from this point. It would do more harm than good. First bring his confidence back up by taking the pressure off. Give him praise and something different to think about before going back to start again at a previous stage that he has already mastered. Remember this should be fun for your dog so try to keep it interesting and pressure free. It should also be fun for you. It’s great to see your dog learn and build confidence in his ability. You will soon start to recognize when he has found his reward by the slightest change in his body language. The ultimate test will be asking someone else to hide the reward within a search area and keep the location to themselves. This will ensure that you and your dog both rely on his nose and your trust to win the game. A true team and a great trick for impressing family and friends. P.S. 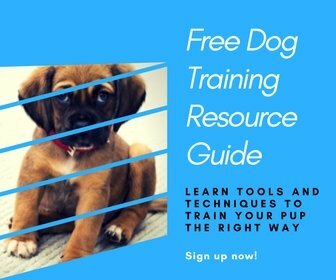 Help a friend teach their dog to search by pinning this!